Have you joined Derby Nation yet? Well why the hell not?! Derby Nation is a community for anything and everything related to roller derby! Post your bout and event dates. Share pictures. Create groups for your league or team. Chat on the message boards. Blog about derby life. Besides having a logo which is what I totally wanted for Inter Derby but couldn’t design (haha) they also have many awesome features, the best one being events. It’s a bit like a myspace-esque site, where you can add friends, join groups etc. As you can tell by the lack of postings, things have been a bit hectic for alot of the staff on Inter Derby. So we’re taking a small break to reevaluate, get some more bloggers, and possibly redesign (MAKEOVER!). Stay tuned, we should be back by August in the least. Team Canada is 1-1 for their bout against Birmingham this Friday! Will they return home victorious? I must appoligise for the lack of content on the blog recently, life has been very busy for me lately. For those who don’t know, I am back in Canada for a short while for I need to apply for a visa to go back to the UK for a length of time. But this doesn’t mean I go derbyless, for I have landed in the heart of Canadian Roller Derby: Ontario. There are so many leagues here, its great! I got to practice with the Tri-City Roller Girls, and am more then likley going down to Hamilton to see the Hammer City Roller Girls season opener. On top of all that, a friend of mine has decided to start a travelling team (Middlesex Massacre Roller Girls) and I have been helping her do all the wonderful things you need to do when you start a team/league. So with that and working, I’ve been very busy. However, new seasons are upon us, as well as many season openers, a slew of UK interleague bouts, the Canadian Beast of the East tournament, and new teams popping up all the time, there will be no shortage of international derby news! LRG in the London Paper! 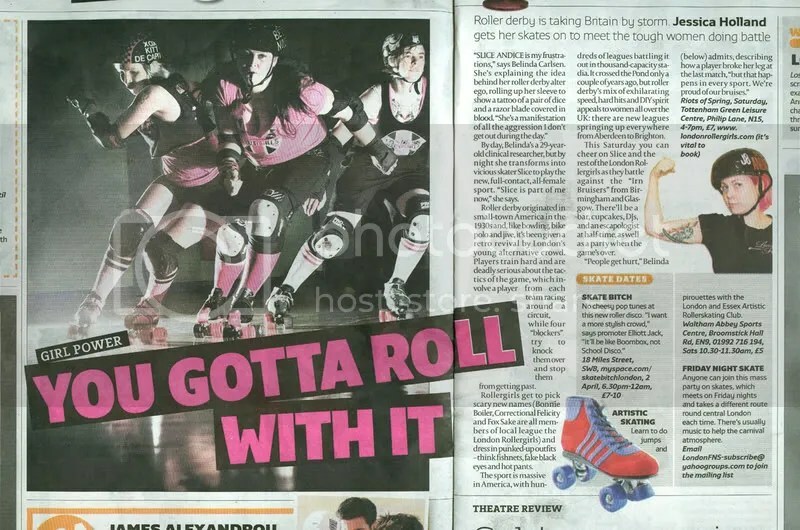 Just before their bout with Glasgow Roller Girls, the London Roller Girls are featured in free rag: London Paper! On Monday 10/3 2008 our friend and referee Calle Feuk died only 35 years old. He he joined us in Stockholm Rollerderby very recently and many of us had just begun to get to know him. But even though that was the case he had already managed to make an impact with his enthusiasm and energy. Our thoughts go to those who were closest to Calle. i think i wrote the same post on two different occasions in this blog. if not in this blog, i wrote one of them on another one. that’s what happens when you write about derby in too many different places. oh well, deal with it. besides that, did you know that there is an EXPLOSION of roller derby in canada right now? i have heard of leagues starting up all over the place in the last two weeks. Winnipeg Roller Derby (Winnipeg, Manitoba) first meeting tomorrow!!! You want to know why I like my derby international? Well honey, I like my derby international because I feel like if I were to go anywhere in the world (with a derby league), I would be welcomed into the city as if it were my own home. I bet I could go anywhere and have a place to stay, instant friends, and a guarenteed good time. Pieces of Hate, I’m looking in your direction, mama! On a different note, those Canadians are appearing all over the place. Last week at Blood and Thunder Training Camp in San Diego (hell yes! ), and met up with some canucks from Ottawa, Calgary, Edmonton, and Victoria. It was a pleasure to see the ladies representing. I just LOVE watching WFTDA on tv. Yes, they show MavTV here in England, and its bloody awesome. Windy City Rollers rock my socks. BRAND SPANKIN NEW: Inter Derby! Welcome to the new blog dedicated to international roller derby. Roller derby has exploded all over the world, and I have made this site to chronicle its trials and triumphs! News, videos, bout scores and recaps, we will have it all! I am looking for BLOGGERS! This means you! If you would like to contribute any way you can, please contact me at hooligal1@yahoo.com . I am looking for regular contributors as well as one-off submissions. Please, international derby lovers only! I welcome any news and tidbits from america, but this is a internationally focused forum only! Sorry! Also accepting links to go in our sidebar, of roller derby related sites, and league sites too! Please give me an email. Right now I am just in the process of buidling this site, so please mind the mess!